The Rainforest Safari delivers two weeks of fascinating nature explorations from the Caribbean to the Pacific! You’ll be visiting four of Costa Rica’s most diversified natural habitats, some only accessible by boat or plane! You’ll start by visiting the remote Caribbean coastal village of Tortuguero where you’ll cruise the famous jungle canals by boat before heading cross country to Arenal Volcano to hike the rainforest, go down the Rio Penas Blancas River, and soak in the volcano’s natural hot springs. From there you’ll be going up into the mountainous Monteverde Cloud Forest region hiking across hanging bridges to see more unique plant and animal life within the giant forest canopy. You'll wind down at the Pacific beach town of Manuel Antonio where a guided hike will take you to see the wonderful wildlife living in Costa Rica’s number one visited national park. After your first night at an inn, you’ll be staying in ecolodges and a boutique hotel surrounded by nature. As with our other specialized nature tours, the Rainforest Safari vacation is a value-packed itinerary that can be 100% customized to meet your budget and needs. Check pricing notes for details. Take Advantage of Green Season Discounts of up to $300! 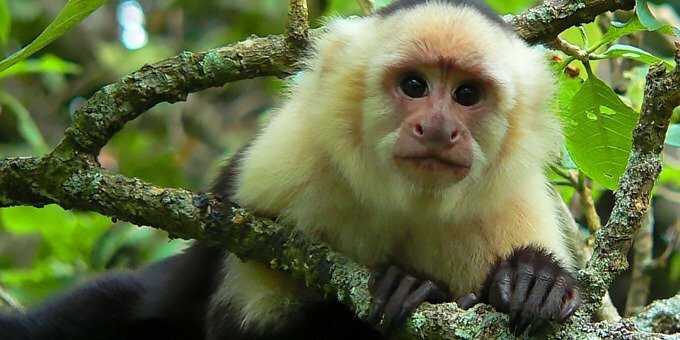 The Rainforest Safari provides two incredible weeks of exploring four of Costa Rica’s top nature destinations. A trip to Tortuguero’s remote Caribbean coastal canals, an exploration of Arenal Volcano’s lush rainforest, inland rivers, and natural hot springs, a walk across hanging bridges to discover the unique habitat of Monteverde Cloud Forest, and a guided wildlife hike through Manuel Antonio’s national park on the Pacific coast. The Rainforest Safari is fully customizable, so you can fine-tune it to your personal taste for an even more perfect vacation! We’ll be waiting your arrival at Juan Santamaria International Airport near San Jose and then send you by private transfer to a nearby airport hotel, Country Inn and Suites. 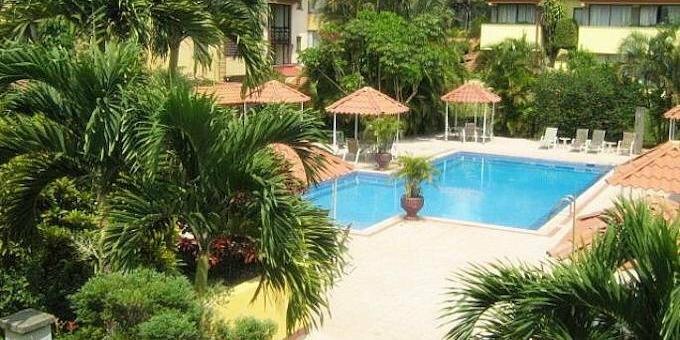 You’ll wash away your travel day lounging in the hotel courtyard’s swimming pool surrounded by tropical gardens. In the morning, you’ll leave for your first adventure, the wilds of Tortuguero, on the northern Caribbean coast. On the way, we’ll stop for breakfast at a typical Costa Rican restaurant and continue until the road ends at a dock on the river. A boat will be waiting to take you through the Tortuguero Canals until you reach Mawamba Lodge, where you’ll stay for the next couple of nights. Tortuguero is one of the least accessible and wildest places in Costa Rica, as it can only be reached by boat or plane. Ideally located deep within the wilderness, Mawamba Lodge provides a colorful no-frills ecolodge and base from which to explore this amazing area. After arriving at the lodge, you will have lunch before going by boat to the village of Tortuguero to learn about the local culture, visit the museum and beach area. You will also stop by the Tortuguero National Park ranger station where you will pay cash for the park entrance fee. The next morning, a naturalist will take you on a guided hike through the tropical gardens at Mawamba Lodge. In the afternoon, you’ll cruise the jungle observing wildlife on a guided riverboat safari through the canals of Tortuguero National Park. 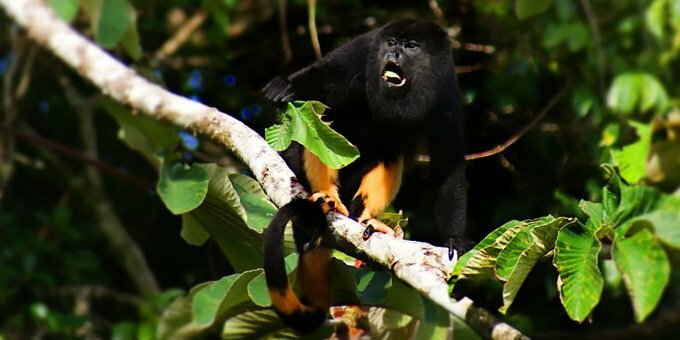 You may have the fortune to see such animals as the three-toed sloths, spider monkeys, caiman, poison dart frogs, macaws, and any number of other wildlife species inhabiting this protected wilderness area. After breakfast the next day, you’ll take a boat from the ecolodge back to the mainland and then continue by ground transfer to a restaurant for lunch. At the restaurant, you’ll change to a different ground transfer before continuing on to Arenal Volcano. You’ll arrive at the Arenal Springs Resort and Spa, which offers magnificent volcano views and onsite thermal hot springs. This will be your new base for the next couple of days exploring the Arenal area. You can spend the rest of the afternoon relaxing at the resort. The next day, you’ll be going on a guided hike through the rainforest at the base of Arenal Volcano. Your guide will tell you all about the history of the volcano and point out the visible wildlife. With a little luck, you may see such animals as toucans, iguanas, monkeys, or pizotes. Eventually, you’ll reach an observation point with great volcano views (weather permitting of course). 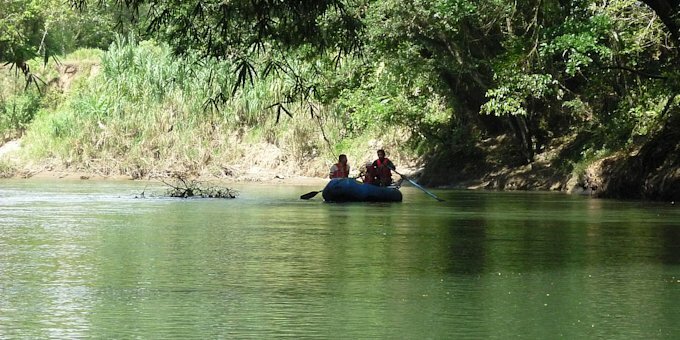 On Day 6, you’ll go for a leisurely Safari Float on the Rio Penas Blancas. You’ll be in a whitewater rafting boat but don’t worry, there are no rapids! As you float down this beautiful river enjoying the scenery, your guide will be on the lookout for monkeys, sloths, crocodiles, iguanas, and many other species of wildlife. Once back at the resort, be sure to take advantage of the onsite hot springs! The next morning, you’ll be picked up and taken to Lake Arenal, where you will board a boat and cross the scenic lake. 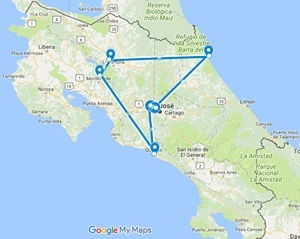 When you reach the other side, a ground transfer will be waiting to take you through the countryside, up into the mountains, and on to the unique cloud forest of Monteverde. You’ll be staying the next few nights at El Establo Mountain Hotel, perched on a hillside overlooking the forest and village. 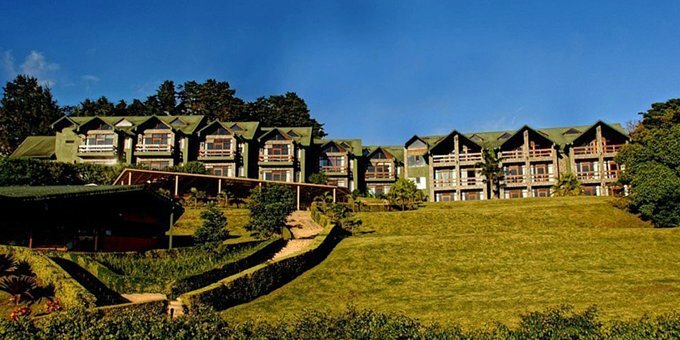 This rustic lodge offers onsite trails, a heated swimming pool, spa services, restaurant, and a bar to make your stay in the typically cool Monteverde region nice and cozy. By now, you’ll likely be ready for a break, so we leave Day 8 open for you to have some unscheduled time to relax or explore the area on your own. The small town of Santa Elena is surprisingly full of interesting things to do from museums and art galleries to a cheese factory and excellent restaurants. You might want to visit one of the cloud forest parks, do some souvenir shopping, or hike back at the lodge and lounge around the heated pool. The following morning, you’ll be ready to hit the trails on a guided hike through the cloud forest at the Selvatura Hanging Bridges. Your guide will lead you along both the forest floor and over suspension bridges pointing out many species of unique flora, such as orchids, and fauna found at different levels in the canopy. For the avid birder, the cloud forest habitat contains many species of highland birds such as the resplendent quetzal, emerald toucanet, hummingbirds, trogons, and more. Depending on the day, you may run across such mammals as pizotes, agoutis, Baird’s tapir, the collared peccary or spider monkeys. Of course, a variety of interesting reptiles and amphibians live here too! 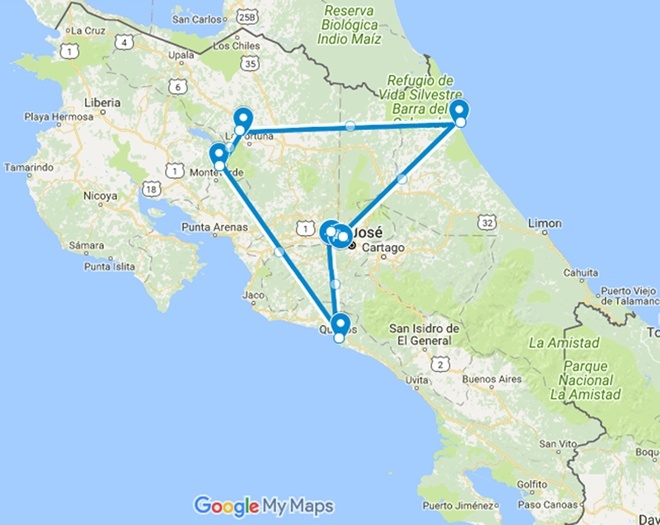 On Day 10, we’ll provide a transfer down the mountain, then head south along the Pacific coast to Manuel Antonio. This jungle-beach destination offers gorgeous palm-studded beaches and is home to loads of wildlife. You’ll stay at The Falls Resort, which is located in the hillside resort area and surrounded by jungle. The small boutique hotel is well-known for great service, comfortable rooms, and the delicious offerings at its popular restaurant. The next day is yours to rest or go exploring on your own. Head to the beach for a relaxing day of fun in the sun, go shopping in the small village, or just enjoy the pool and lounge area back at the resort. In the morning, you’ll go with a naturalist on a guided hike at Manuel Antonio National Park. 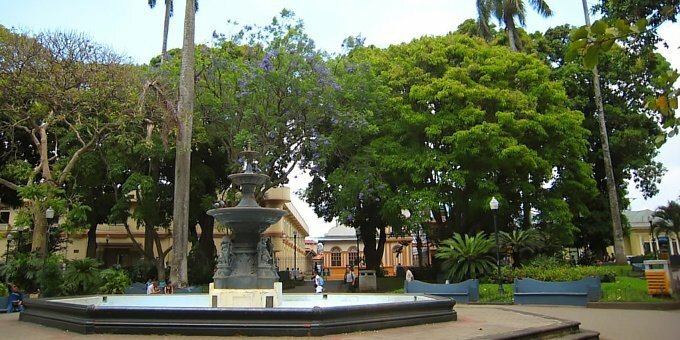 The park is the smallest national park in Costa Rica but one of the largest in terms of biodiversity and popularity. Countless species inhabit this jungle including capuchin monkeys, sloths, colorful frogs, ctenosauras, and much more, so bring along your camera! On Day 13, you’ll have another free day to revel in the tropical weather, lie in a hammock, walk the beach or take a swim. If you want to add one more adventure, you can easily customize your itinerary. On your final day, we’ll provide a private transfer back to the airport for your flight home. Again, like all our other combination destination vacations, the Rainforest Safari can be fully customized to match your interests to give you the perfect vacation! We will be waiting for your arrival at San Jose’s Juan Santamaria International Airport and will then provide a private transfer to the nearby Country Inn and Suites. Relax, unwind and enjoy your first day in paradise! 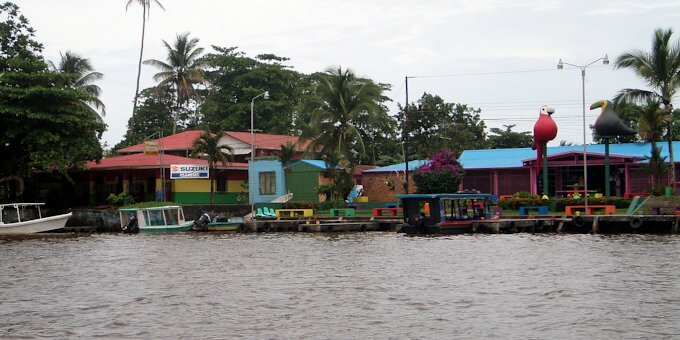 The transfer to Tortuguero, on the Caribbean coast, is by a combination of land and boat transfers. You’ll be leaving early in the morning and will have breakfast en route. After checking in at Mawamba Lodge, you’ll have lunch and visit the village of Tortuguero to learn about local culture, tour a small museum, visit the beach area, and stop by the Tortuguero National Park ranger station to pay the mandatory park entrance fee in cash. ($15 per adult, $5 per child between the ages of 5 - 11, and free for children 4 years or less). The day starts off with a guided hike to see the resident wildlife living on the grounds of Mawamba Lodge. 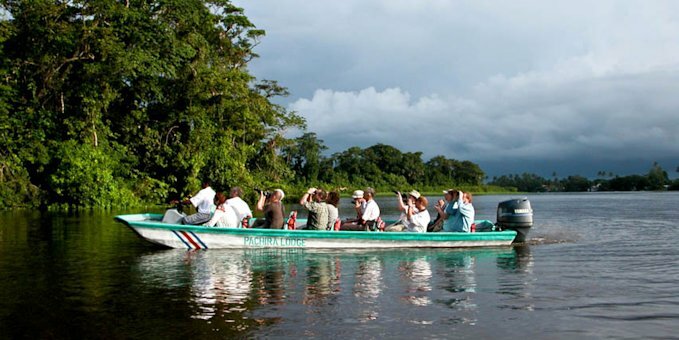 In the afternoon, you’ll go on a riverboat safari cruising the canals of Tortuguero National Park. Both tours provide amazing wildlife observation opportunities, so don’t forget your camera! You’ll be leaving Tortuguero by boat back through the canals to the mainland dock and then continue by land transfer to a local Costa Rican restaurant for lunch. After lunch, you’ll change to another land transfer that will take you to Arenal Springs Resort and Spa at Arenal Volcano. Enjoy the volcano views and onsite hot springs! 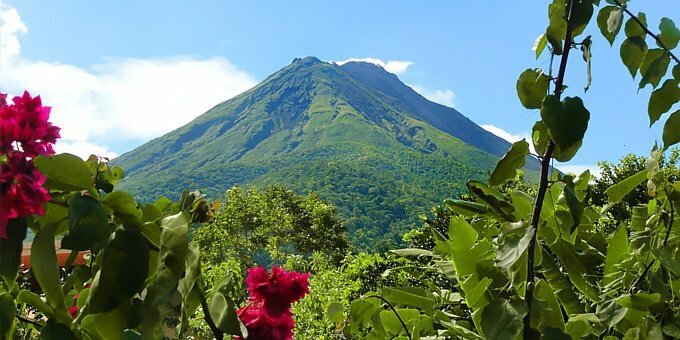 A bilingual guide will lead you on an informative hike through the rainforest at the base of Arenal Volcano. You’ll learn about the history of the volcano, the jungle inhabitants, and will likely see plenty of animals. The Safari Float on the Rio Penas Blancas river provides another unique way to look for wildlife. You’ll be floating down river in a whitewater rafting boat, but no worries, it’s a calm ride without rapids. With a little luck and a lot of experience, your guide will point out any visible animal life along the river’s edge. Once back at the resort be sure to enjoy the onsite hot springs as this will be your final evening in Arenal! Today you’ll be taken to nearby Lake Arenal to board a boat that will go across this beautiful scenic lake surrounded by mountains. 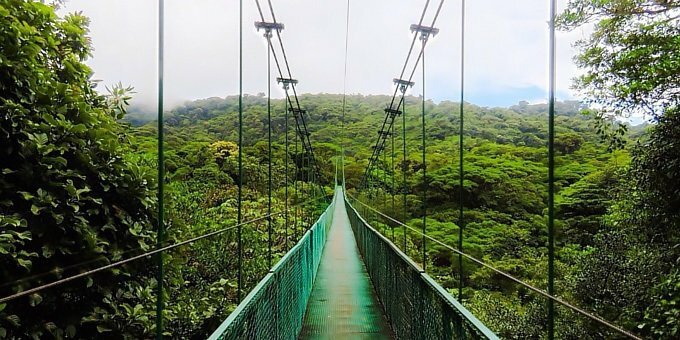 When you reach the other side, you’ll switch to a land transfer that will bring you through the mountains to the cloud forests of Monteverde, where you’ll stay at the El Establo Mountain Hotel. No activities are planned for today. You’re on your own to explore the Monteverde area, the village of Santa Elena, the cloud forest reserves, or just relax at the El Establo Hotel enjoying the heated swimming pool or indulging in a spa service. The Selvatura Hanging Bridges guided hike offers both terrestrial trails and suspension bridges throughout the cloud forest. Your guide will lead the way showing you various highland plants and wildlife, explaining their intricate relationships and dependence on each other. A transfer will be provided down the mountains and over to the Pacific coastal area of Manuel Antonio. Here you’ll be staying at The Falls Resort where you can enjoy the hotel’s relaxed vibe and swimming pool this evening. We leave this day free of activities so you can explore Manuel Antonio on your own. Go down to the beach for some fun in the sun, explore the rainforest, or do some souvenir shopping. Of course, you can simply relax and enjoy the tranquil surroundings at The Falls Resort. A naturalist guide will lead you on an easy hike through Manuel Antonio National Park. Bring your camera as this park is loaded with beautiful scenery and lots of wildlife! Enjoy another relaxing day on your own in Manuel Antonio or go exploring as this is your final day in paradise! Additional tours can always be arranged if you wish to change your itinerary. We’ll provide a private transfer back to the airport for your flight back home. Low Season 2018 rates start at $1,475 USD* per person double occupancy, $1,275 USD* pp for triple occupancy, or $2,424 USD* pp for single occupancy for the lodges listed above. High season 2019 rates start at $1,764 USD* per person double occupancy, $1,545 USD* pp for triple occupancy, or $3,000 USD* pp for single occupancy for the same lodges. Low Season 2019 rates start at $1,645 USD* per person double occupancy, $1,421 USD* pp for triple occupancy, or $2,762 USD* pp for single occupancy for the same lodges. You can upgrade or downgrade hotels to match your preferences and budget.